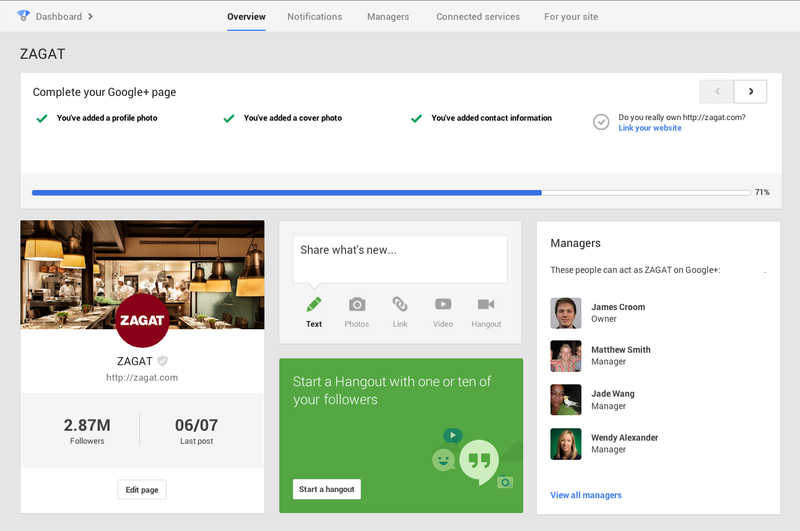 Google today launched a new dashboard for businesses and Google+ page owners that will provide them with a single dashboard to manage many of their daily activities around Google’s tools. The new dashboard will, for example, allow businesses to update their info, including their website URLs, store hours and phone numbers, across Google Maps, Search and on Google+ right from the tools Overview tab. In addition to managing their info across Google’s properties, the new dashboard will also give businesses the ability to monitor their Google+ notifications and to perform standard Google+ actions to manage photos and videos. They can also start Hangouts right from the dashboard. Besides managing their presence, Google also allows these users to manage their AdWords Express and Google Offers campaigns and provides them with a number of stats for their businesses. These stats are actually pretty interesting and not something Google has made available in an easy to use package before. They will allow business owners to see the top searches for their business and top locations requesting driving directions to their stores (so they can strategically place local ads, for example). It will also display a set of basic performance stats for their Google+ accounts. It’s fascinating to see Google build all of these tools itself. That’s a big contrast to Facebook’s approach, which has focused on opening APIs to let third-parties build presence management tools for businesses. Google gets tighter control of the experience, but can’t provide. customized set-ups for different types of businesses. Google’s been trying to unify its consumer-facing products. Seems the insistence on cohesion is making its way to its business offering as well.